Is your Maternity Leave Almost over? Do you still want to workout up the end but don’t want to join for the full 6 weeks? Want to just do 1 class a week for a while?? Well here is your solution to keep your Mummy Bootcamp groove on! 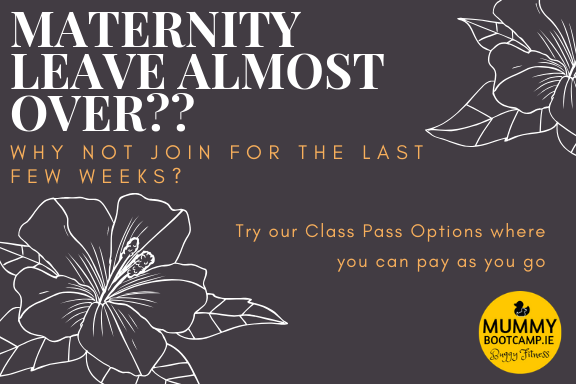 You have the option to just buy 1, 6 or 10 class passes and we introduced this to enable people to still attend classes, but may not be able to commit to a full 6 weeks for various reasons (return to work, holidays, other commitments etc). So that you can sort of use them as a pay as you go option, where you can purchase the class passes in advance. To do avail of them, you will need to log into your account, or create a new one, at the www.bootcampireland.com website (you will see the red button on the top right corner of the home screen). Read through the liability waiver/terms & conditions and at the bottom of the page click ‘I Agree’ and ‘continue’ . We may have already set up an account for you, if so, you will see your name already appear and follow the instructors on how to retrieve your password. Once this is done your account will be set up! We also have an app you can download on your phone which makes accessing your account really easy. The link for IPhone is here and android is here. With your account, feel free to check your account details, visit history etc. When completed, then select the ‘Buy Membership’ tab, then scroll down to ‘class passes’, then select 1, 6 or 10 class passes (€15, €70 or €100 respectively). Your account will hold your cc details if you wish, and this is secure and encrypted and makes future purchases, so much handier, even on your phone. Once you purchase your class passes, it may say to book in, but you can only book in if going to evening bootcamps or Saturday bootcamps, you cannot book in to Mummy Bootcamps or Hiit classes, if you are going to the latter, simply give you name to your instructor at class, and we will book you in! You can see how many you have left by logging in. The 6 class passes last up to 3 months, and the 10 lasts up to 6 months and can be used at all our Bootcamps. Let me know if any problems with it.